The Sterlite deep clip box has the capacity to hold a large variety of items. These clip boxes can be used in the bedroom to hold out-of-season clothing or hand-me-down clothes. Holiday decorations can be stored in a Sterilite deep clip box and then placed in a closet, or on basement or garage shelving. Children can use these storage boxes in their bedrooms to hold their toys, shoes, or blankets. Sterilite clip boxes are also helpful in the office for getting your space organized. These storage containers fit well when stacked with the other Sterilite clip boxes. Deep clip boxes have with transparent lids with clips that latch tight but are also easier to open. If you're looking for higher bulk quantities or the Sterilite clip boxes, give us a call Monday through Friday 8:00am-5:00pm central. 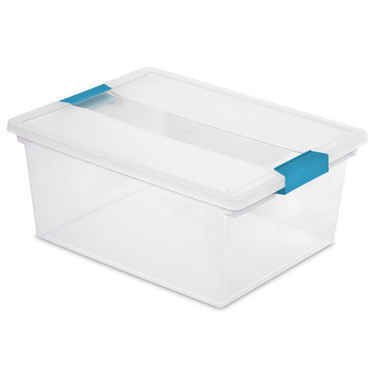 See more large plastic storage containers.